Southern Baptist Disaster Relief – Hawaii Pacific Baptist Convention is a network of over 150 churches, including churches in the Hawaiian Islands as well as 13 churches of the South Pacific Baptist Association, 10 churches of the Baptist Association of Micronesia, and 7 churches who are a part of the Asia Baptist Network. We are a faith-based organization that promotes religion throughout the community on the island. Since our location makes it difficult to receive goods, we experienced a huge issue this past August when Hurricane Lane made landfall on the island for three days accumulating a record of 31.8 inches of rain. 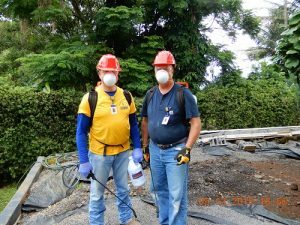 After the hurricane passed through the island, volunteers assisted residents with cleaning flood damage and the removal of mold from their homes. Thanks to Good360 and the collaboration efforts of Airlink, United Airlines, Hawaiian Airlines, ALAN and Flexport we received safety supplies and Shockwave products in Hawaii to help with the devastation. A lot of products could not make it to the island due to high shipping costs, so this donation was a huge blessing to all the residents. This allowed us to use our limited funds here on the ground more effectively during the response and preparedness efforts. Since we are a volunteer-based organization, it was great to see volunteers from Texas come and help us after the devastation. They volunteered for two weeks to help us in Hawaii with flood recovery after Hurricane Lane and they made it possible, along with the donated Shockwave product, to clean up homes for 21 families. Two other VOAD organizations, All Hands and Hearts – Smart Response and Team Rubicon helped with chainsaws clearing most of the debris in the streets from the flood. These donations will help us recover during this storm and possibly future storms as the donation far exceeded our expectation. We are so grateful to Good360, Airlink, Hawaiian Airlines and United Airlines for their partnership.